ConcordiaUA offers a Dual Diploma Master Program with the University of Koblenz-Landau (Germany). Dual diploma program of Ukrainian-American Concordia University (WIUU) and University of Koblenz-Landau – The Entrepreneurial University. On November 29, 2017 our university hosted the presentation of dual diploma program of Ukrainian-American Concordia University (WIUU) and University of Koblenz-Landau – The Entrepreneurial University. Rector of Ukrainian-American Concordia University, Professor, Dr. of Economics, Dr. of Education Oleksandr Romanovskyi announced the opening of the Joint Dual Diploma Master Program with the University of Koblenz-Landau (Germany). The Cooperative Degree combines University of Koblenz-Landau Degree – Master of Science in Information Management (Major in Entrepreneurship, Technology and Innovation Management) – and Ukrainian-American Concordia University Master Programs – International Management or MBA. The event was attended by representatives of Koblenz-Landau University Mr. André Schneider and Ms. Denisse Mendoza, government officials, local authorities, and also our Ukrainian and foreign partner institutions, organizations and businesses. Prof. Dr. Oleksandr H. Nakonechnyi, president of the Academy of Sciences of Higher Education. The university has a prominent position in education and teacher training in Rhineland-Palatinate. It is the only university which offers teacher training courses for all school types. This core competence characterises the university’s profile. Key features are also the combination of education and teaching methodology, the great importance attached to extra-curricular locations and school laboratories as well as the linking of theory and classroom practice, for example, via the Campus-School Networks. This subject area is characterised by the humanities, cultural studies and social sciences, in which in particular languages, art and culture, politics and the economy are analysed. The subject area is also characterised by psychology (one of the social sciences) as well as by computer science, which optimises and tests extensive IT-based services that have been developed for their practical value to people. Three scientific approaches characterise this subject area. The life science approach broaches the issue of the environment from a scientific perspective, whereas computer science deals with the digital world, and the humanities and social sciences understand the world in terms of culture and society. The rise in student numbers demonstrates that both the Koblenz and Landau campuses are popular places to study. The number of students has increased threefold since 1990. In the meantime there are approximately 15,000 students enrolled on programs, half of these in Koblenz, the other half in Landau. When compared to very large universities, teaching and studying is conducted in manageable structures at Koblenz and Landau, which fosters a much closer student community as well as a closer-knit teacher-student community. The university offers future specialists and executives a diverse range of Bachelor and Master programs in education, social sciences, cultural studies, the humanities and life sciences as well as psychology and computer science. The traditional core of teaching at the university is its teacher training programs for all school types. In the area of continuing education a sophisticated range of study programs, distance-learning programs as well as seminars has been developed for an ever-changing working and professional environment. The majority of the programs and courses on offer are designed to be in-service in character, thereby allowing students to combine both work and study. These programs are being consistently built upon and expanded. Research is conducted in nationally and internationally linked working groups. The University of Koblenz-Landau also works closely together with partners in the local area. What is characteristic is the balanced relationship between theoretical and applied research. Current areas of research include education, environment, computer science as well as the humanities and social sciences, based on the three subject areas of the university. The transfer of technology is one of the central tasks of the university and allows the systematic and planned utilisation of new scientific and technological knowledge in the economy, politics and society. The university of Koblenz-Landau also promotes business start-ups in academia and the development of an entrepreneurial culture. The international character of research and teaching as well as of university life is a quality feature of a modern university. The university of Koblenz-Landau wants to both expand and intensify its international direction. Today this is essential not only in the global economy, but also nationally. Internationalisation is an interdisciplinary task facing the university in all areas and at all levels. In order to push this process further forward, the number of international research projects and cooperation agreements should, for example, be increased, and the number of outgoing exchange students as well as incoming ones should be raised. This should, in addition, be coupled with an increase in the number of internationally oriented study programs. Promoting young academics is one of the core tasks and responsibilities of the university. The quality of our young academics is not only a significant factor in enhancing the university’s research potential, but it is also at the same time an indicator of the university’s presence and reputation. Graduate colleges and schools as well as an interdisciplinary PhD center were all established to promote young academics further, and this range of measures is to be expanded in the future. The university is committed to the principles of a pro-family university. Men and women employed at the university should be able to combine work, study, and the upbringing of children or the care of relatives. The university has therefore taken steps to achieve this aim, for example, with the provision of child care services and introduction of flexible working hours, or by promoting specific support programs. One particular feature of the university is its organizational structure. Koblenz and Landau are centers for teaching, research and continuing education. The central link of the entire organization is the President’s office in Mainz, where the university’s executive board and several areas of its main administration are located. In Koblenz, research and teaching is conducted in four faculties on a modern campus, which is just a stone’s throw away from the banks of the river Moselle. The university at Landau also consists of four faculties, and the main campus is being extended with additional university sites in and around the city of Landau. The Agreement between WIUU and the University of Koblenz-Landau (Germany) on Dual Degrees Master Programs has been signed! WIUU Academic Administration Team at the University of Koblenz-Landau (Germany) participating in a training week on the Master Dual Program issues together with colleagues from Germany, China, Ecuador and Vietnam. at the Institute of Social and Sustainable Economics at our partner University of Koblenz-Landau (Germany). Thank you for many years of fruitful cooperation and your great help in the development of Higher Education of Ukraine and integration of Ukraine into global democratic world. Ukrainian-American Concordia University has established successful cooperation with the USA, Germany, Britain, Poland, Bulgaria, People’s Republic of China etc. 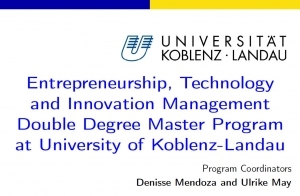 Now we are proud to announce the Opening of the Joint Dual Diploma Master Program with the University of Koblenz-Landau (Germany). I will appreciate if you could let me know if you would be able to be with us together at the presentation.